Will your Backup Plan Answer the Recovery Call? Simply conducting regular backups or having them stored off-site doesn't guarantee you’ll be ready for a disaster - just ask the company that's rebuilding servers after an outage. Like insurance, a disaster recovery plan needs to be comprehensive, full-time and reviewed regularly to make sure it can restore critical applications in an acceptable time frame. Unfortunately for many companies, especially in the mid-market space, their ‘insurance company’ isn’t answering the call. QuorumLabs has created a disaster recovery system that mid market companies can implement, easily maintain and still afford. 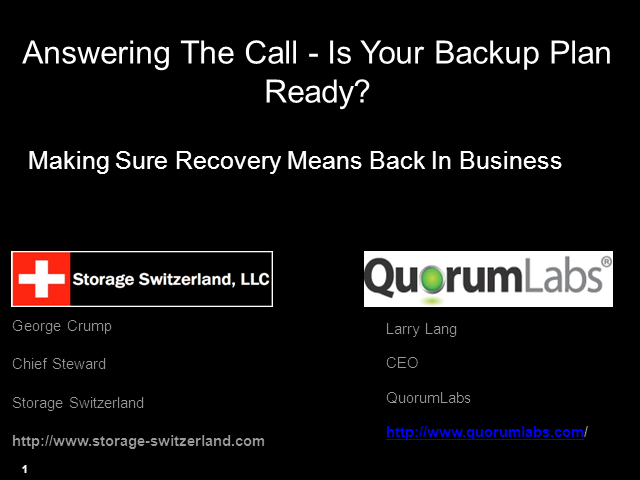 In this webinar QuorumLabs and Storage Switzerland will discuss the realities of backup, testing and application recovery for the mid-market, and explore the alternatives available for a reliable, affordable disaster recovery system. Title: Will your Backup Plan Answer the Recovery Call?